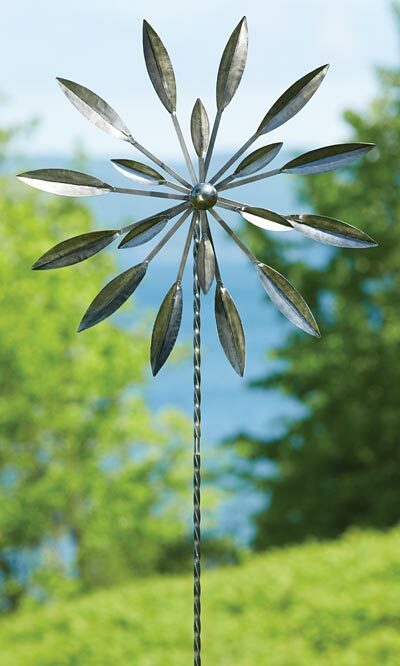 Add a contemporary, floral-inspired sculpture to your backyard with the Ancient Graffiti Kinetic Single Petal Spinner. This hardy, iron unit will surely bring dramatic style to your yard, thanks to its generous height and gray hue. Its 71" tall, twisted iron stake creates a hardy support, and its 15" wide, trident base inserts into soil in moments. Attach the included 17" diameter and 32" diameter, gray toppers to the stake, and situate the unit within your landscaping. Each arm of the toppers culminates in an oval shape with a crease in the center, mimicking flower petals or leaves. The creases not only lend dimension to the piece; they also help capture the wind for great movement in your garden. The gray finish brings a modern hint to the item, while its iron construction remains durable for many seasons. Enhance your landscaping with a blooming flower throughout the year using this Kinetic Single Petal Spinner. Assembly required.